Take out annual membership to become a club member and support the trail building! NOTE. All our trails are rideable on a cross country bike. All our routes start outside the Oak & Vigne Resturant in Greyton but you can also start at the Genadendal Moravian church square. Permits and route maps (Click here to download or click on map below) are obtainable from Vanilla Cafe. Permit fees go straight back into the trails – there is no management fee. See our Permit section for details and 'rules of the trails"
Thanks to the Pedal Power Association whose funding has made these trails accessible to all! This fun loop is great to loosen the legs before a longer ride but also the ideal spot to bring your kids and for any rider not ready to tackle the hills. Just after you cross the Gobos river bridge you enter the Rockhopper Forest with its fun twisty trails through the trees. This section is flat and fast and lots of fun for all ages and levels of experience. As you come out of the trees you can follow the arrow that says ‘Return to Greyton’ or you can continue and the Green, Blue or Red routes. Start by going through the Rockhopper Forest then cross the stiles before and after the ‘Sandpit’. After you cross the second stile (watch out for traffic) you head towards the gun club with a fynbos single track that after a little steep drop takes you into a shady lane. Go through Greyton and along the base of Knietjieshoogte and then back for coffee along the Gobos river trails. All trails are easy fun flowing stuff – nothing too technical or demanding, but fun! Same start into the Rockhopper forest but here you have a choice to follow green arrows if you want to ride the maze of trails in the forest or stick to blue to cut right through the middle, and out across the stiles, through the sandpit and then up to the first bench for a bird’s eye of Greyton. Come back for Boneshaker downhill single track that takes you back towards Greyton. Climb Knietjieshoogte to the second bench and more views of the town and Bosmanskloof, and Genaal in the distance. Another swift single takes you back for coffee. Going in the other direction now past the front of Genadendal and through farmlands for a more open ride with great views back at the mountains hugging Greyton. Mostly jeep track with stretches of single track. Soak up the ambience of the old church square and museum. If you’re lucky they’ll be serving tea and scones under the trees. Ride up Korlandskloof and onto a great single that takes you over to Voorstekraal and then down into the little river crossing before you get back onto the singles that take you to Bereaville. Once through Berea you climb up Davey’s Sprocket, nice gradient switchbacks, and then back down to the Voorstekraal river crossing – be careful of the section of two way trail. Once back at the reservoirs you split off for another fast descent down to the tar and back on Berg st to the Moravian Mission. Get a descent ride in by starting in Greyton on the Wreck route and then split off at the entrance to Genadendal for the Genadendal loop and then instead of turning back to the finish follow the sign to ‘Wreck route’. A nice quick workout worth the effort. 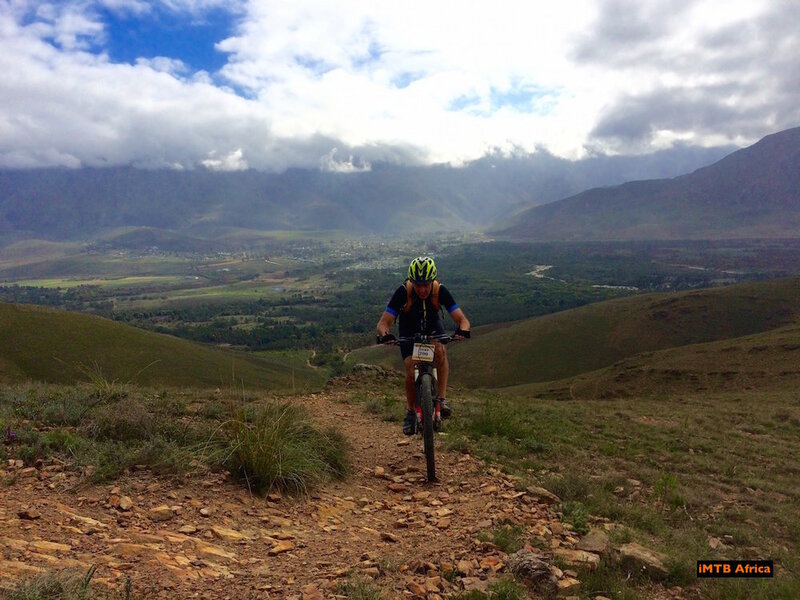 One big climb and a long sweeping drop down into Greyton. If you are short of time and want a big smile on your face this is the one. With a bit more time Bakenskop is even better. Same start into the Rockhopper forest but here you have a choice to follow green arrows if you want to ride the maze of trails in the forest or stick to red to cut right through the middle and out towards your big climb of the day – steep switchback up to where you can catch your breath on views looking back at Greyton nestled into the mountains. Ride the ridge of these hills before dropping down behind them into the forgotten valley. Return along jeep track along the wreck route.